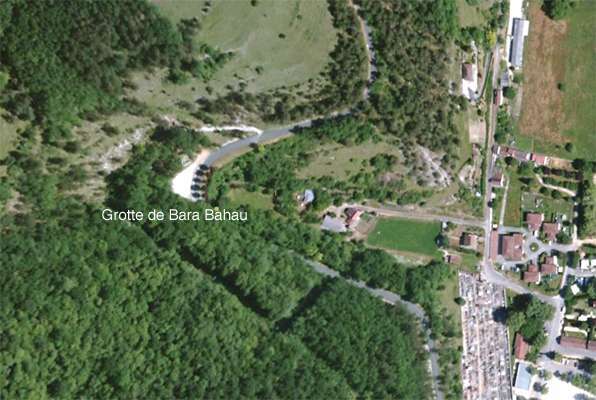 La Grotte de Bara Bahau is an Historic Monument. It is 100 metres long, 12 metres wide, and up to six metres high. 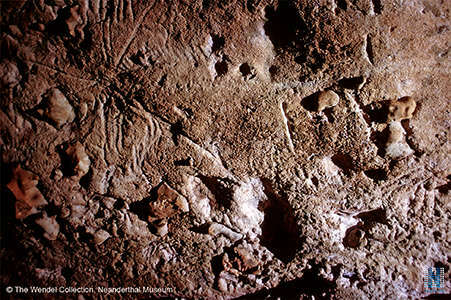 There are many scratches on the walls from the Cave Bears which once inhabited this limestone cave. Magdalenian hunters left engravings of horses, bison, deer, aurochs, human hands, a phallus, and bears, as well as signs whose meaning we can only guess at. There are no paintings in the cave. The cave itself was well known for many years, but the engravings were discovered in April 1951 when the famous caver Norbert Casteret in company with his son and daughter Raoul and Maud, aged 25 and 23, explored the cave thoroughly and discovered the Magdalenian engravings. These were authenticated by Henri Breuil in August of that year. Later, in 1955 Father Glory made a thorough examination of the cave. From 1952 to 1962, Father André Glory undertook a survey of the paintings and engravings of Lascaux, located beyond the room of the Bulls. In 1955, at Bara-Bahau, he used a similar procedure: "with the help of two assistants who held a large plate of semi-rigid plexiglass a few centimeters from the figures I was able to trace the figures onto the plate. The separate drawings were then reassembled from the partial drawings." (Glory, 1955b). 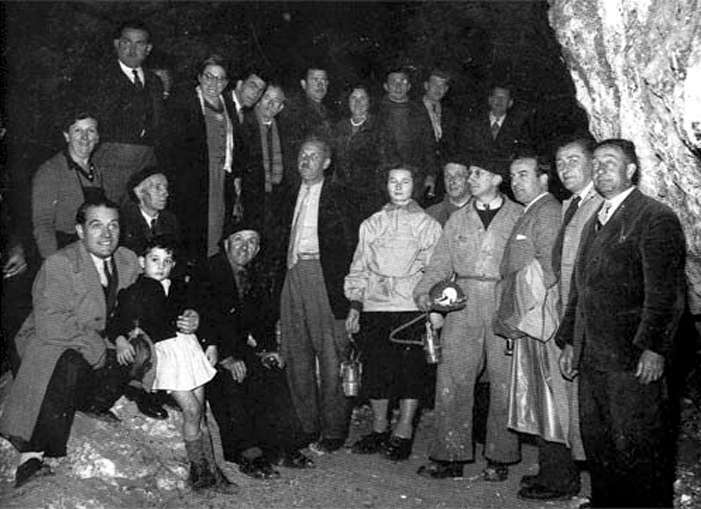 In April 1951, all the prehistory buffs in the Périgord gathered at Bara-Bahau to greet speleologists Maud and Norbert Casteret. 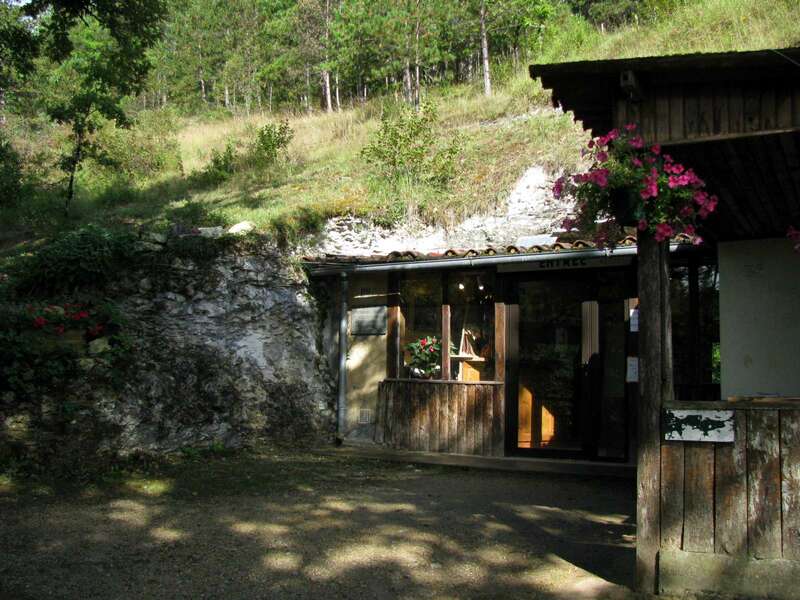 Formerly known as le Trou de la Cocagne, the entrance to this huge cave had long been a popular picnic spot. 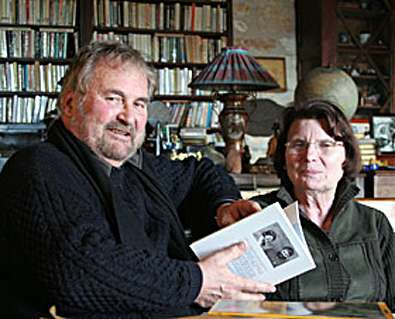 In 1951 Maud and Raoul Casteret were contacted by the president of the Tourist Office in Le Bugue. 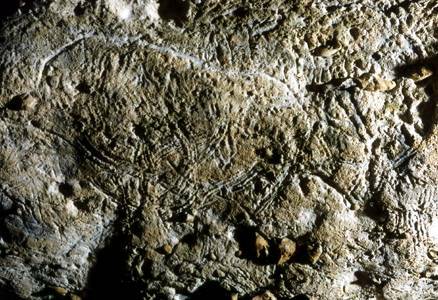 They were asked to thoroughly explore every inch of the cave and it was flat on her back that Maud caught a glimpse of the first engravings: a horse and then a cow with fine horns. She discovered sixteen animals in all. 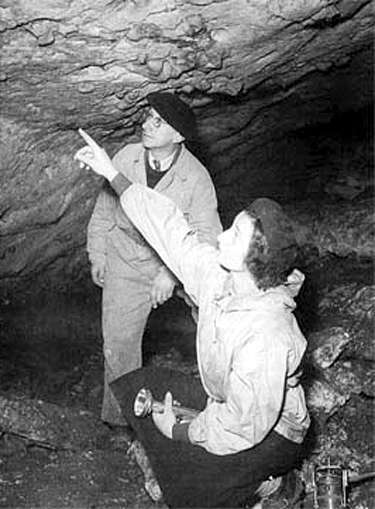 This photograph, possibly taken by Raoul, appears to show Maud with her father, Norbert, himself a famous caver. 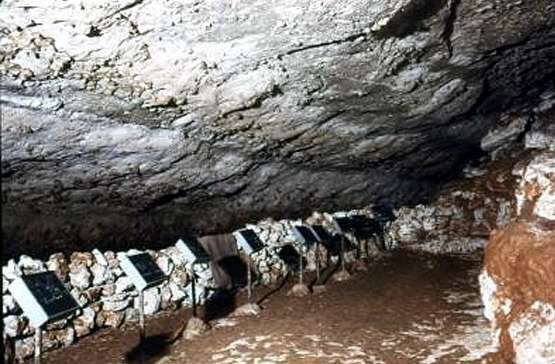 in 1997 Brigitte and Gilles Delluc published a monograph on the cave. They are prominent Prehistorians and Archaeologists. Bara Bahau has adequate parking beside the road which passes it. 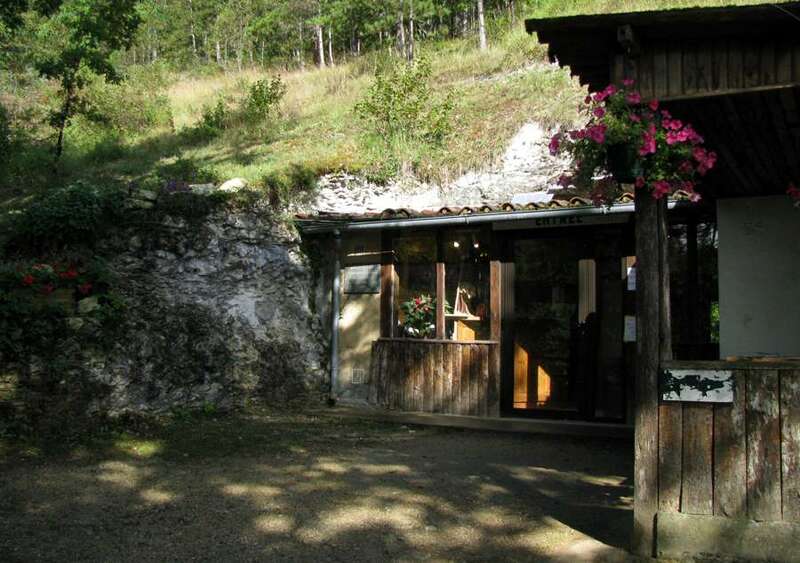 The entrance to the cave is 70 metres above the road on a well made path. The only way I knew that Bara Bahau existed was from noticing this poster in the camping area of Les Eyzies. 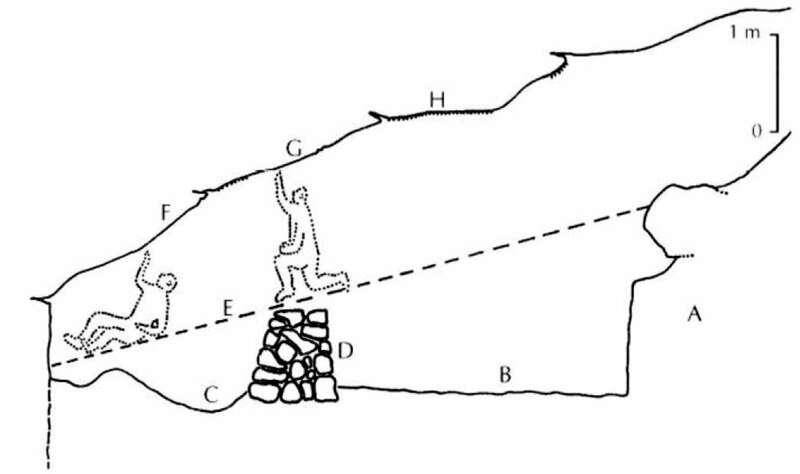 Section through the main room of engravings at Bara Bahau, along the line ee in the diagram below. E old level of the floor. 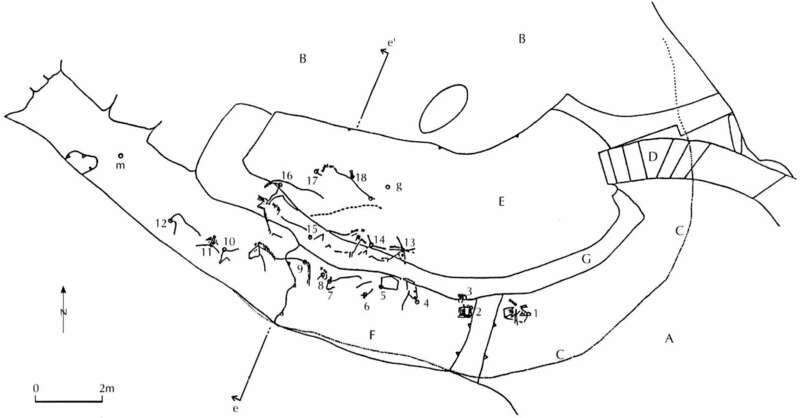 Plan of the decorated zone of Bara Bahau. Prints of the engravings, projected onto the ground, appear inverted. C flat rock lintel at the level of entry. E observation platform excavated from the scree slope. Complete schemata of all the drawings in the decorated area. This is a remarkable and extremely valuable plan, which must have taken a huge amount of work to put together, as well as considerable skill. It is a tour de force by highly professional and gifted researchers, and deserves a much wider audience. Bara Bahau - drawings of the principal engravings. 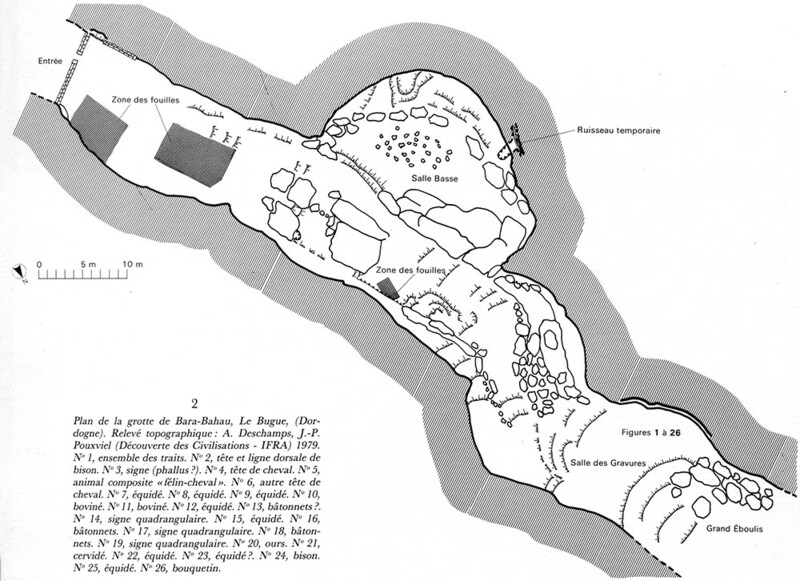 Bara Bahau - Plan of the grotte. 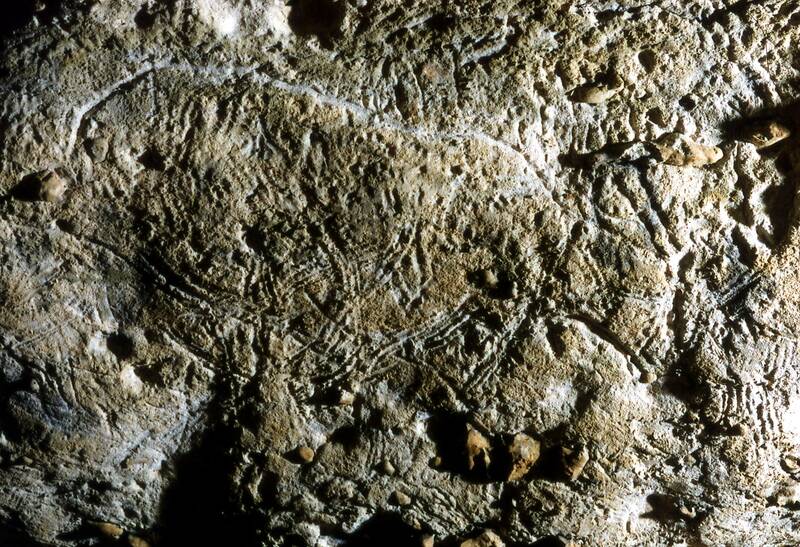 Reindeer engraved on the wall of La Grotte de Bara Bahau. The reindeer is turned to the right, and is strongly etched with an angular, very clean cross-section. It forms a rectangle of 112 cm wide and 54 cm high. Its general axis is oblique to the lower right, the back making an angle of 12 degrees with the horizontal. The outline skirts a little piece of extruding flint in the small of the back and abuts another at the end of the jaw. The ventral line and the legs are not visible. 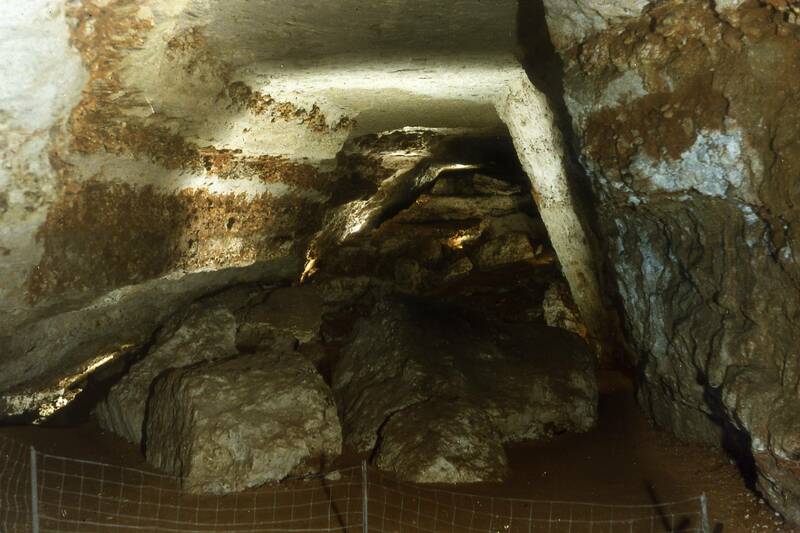 The top of the head (R7) is at 225 cm above the present ground level, and 140 cm above the original floor. The body and head are covered, or nearly so, with vertical fingermarks which could be meant to indicate the coat of the animal. 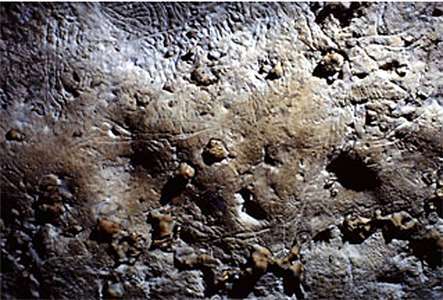 In reality, the sequence of these markings is not certain, and we cannot be certain of their provenance. It is possible to imagine even a chest and two legs on the engraving. 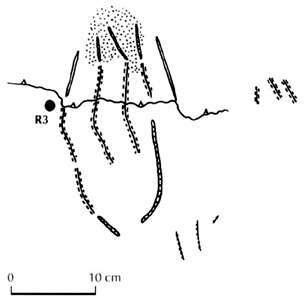 There are a considerable number of Cave Bear scratches over the back and the neck, perhaps more recent, between the head of the animal and that of its neighbour, horse 8. For A. Leroi-Gourhan it is "a deer with the head of a reindeer". P. Leonardi saw "an almost shapeless figure made even more incomprehensible because of the superposition of a tangle of scrapings and "macaroni" which coincides with the engraving." He concluded "The figure is certainly not a rhinoceros". The general appearance is more that of a reindeer than that of a deer: the head held low, a bulbous nose (with mouth indicated), marked withers, a straight cervico-dorsal line , base of the antlers very oblique. 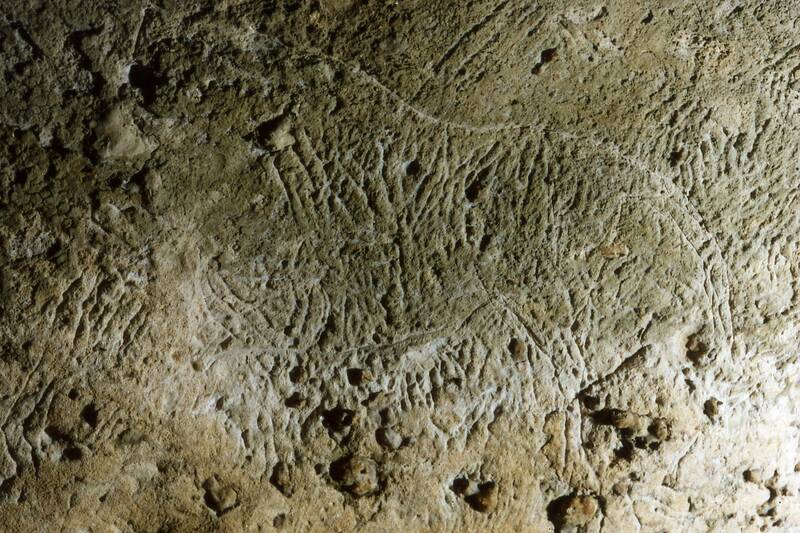 However representations of reindeer are quite rare in Perigord cave art, except at Les Combarelles and Cap Blanc, and are more common in objets d'art. 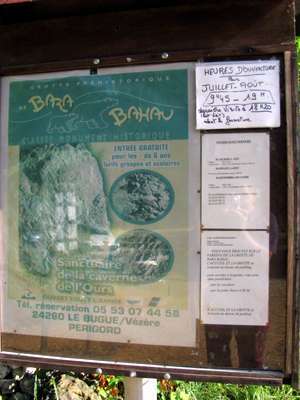 The collapse of the walls and ceiling of La Grotte de Bara Bahau, known as Le Grand Chaos. Bara Bahau (or Bara-Bao) takes its name from the onomatopoeia of the local Occitan language, meaning "bang" in reference to these fallen blocks which are visible in the first room. The Salle des Gravures, where most of the engravings may be seen. This horse is in left profile, and apart from legs, it is complete. The rectangular set of engravings of which it is a part is 172 cm wide and 106 cm high, although the horse itself is 158 cm long. The top of the head is 269 cm above the current ground level, or 160 cm above the original ground level. Its dorsal line is nearly horizontal. The front of the horse is particularly detailed. The horse's head from the base to the front of the nose was engraved with a tool held obliquely. The nose is missing, but the nostril is indicated by a curve, and the mouth by a straight line. Two fingermarks come out from it, perhaps the "breath" of the animal, also represented sometimes at Lascaux and Pech-Merle, for example. The mane is erect over the line of the neck and does not overlap it. It is interrupted in the middle by a flint. 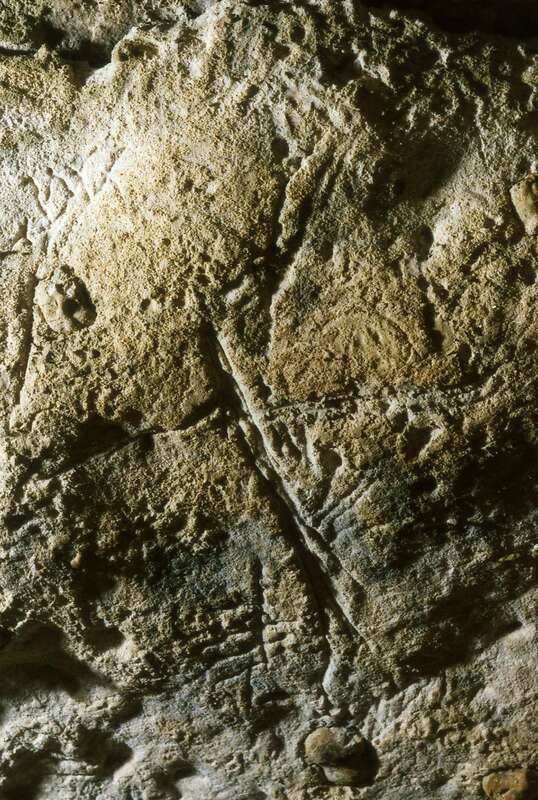 Three long straight lines (one double) are drawn on top of the head (traced with a flint to several points): We do not know the meaning of this. The projection of the shoulder uses a natural convex relief on the surface of the wall. The small of the back is made of a double line. 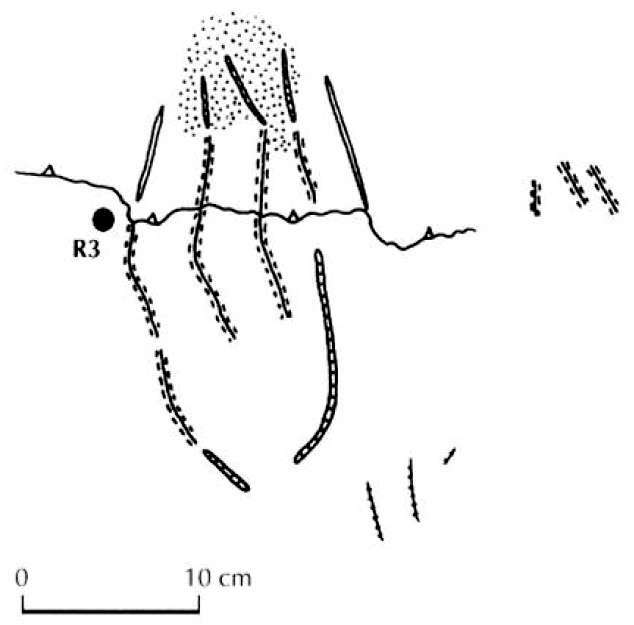 The line of the belly and the tail appear to have been drawn with a finger or similar soft tool. Hairs, made by a series of eight vertical short lines, are shown on the thorax, referring to the normal coat of horses in winter. Like other examples of equines in this cave, the horse is not gendered. 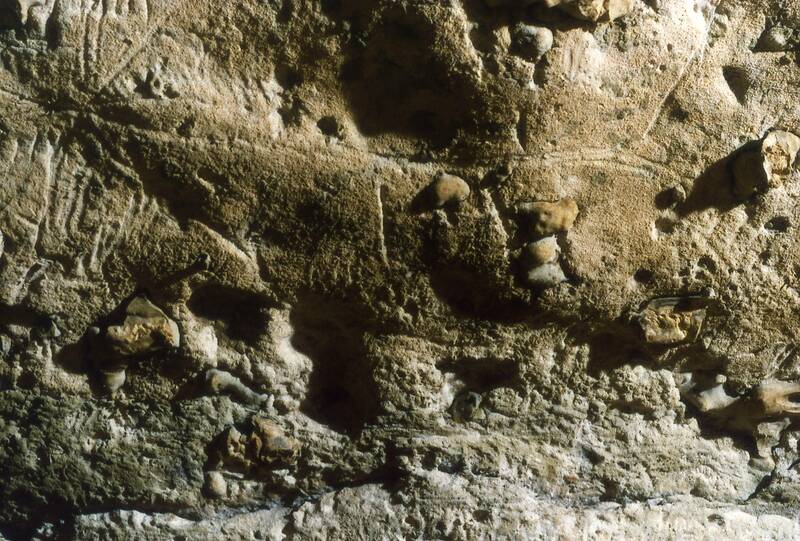 Several features are clearly engraved with a tool with several points (perhaps a chipped tool): the short line behind the mane; the curved line that marks the small of the back, and the two lines in a "V" above the head. This horse is much lighter and smaller than the others in the cave. The neck is fine, it has a short head, the nose is slightly concave, the body is less robust. 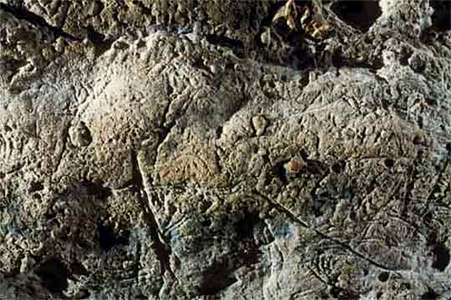 This is an animal without forelimbs, in left profile, etched in a concave wall, a little below and to the right of Bison 17, above the aurochs 15. It forms a rectangle 167 cm wide and 98 cm high. The attachment of the tail is located at 266 cm above the present ground level, approximately 140 cm above the original ground level). The layout of the figure is made entirely using a tool with angular cross section, interrupted at the posterior margin of the thigh and chest. Its posterior leg rests on the nape of the aurochs 15 below, and his foot rests on a flint pebble protruding from the wall. The body of the animal is engraved on a support coated with green clay, like bison 17. 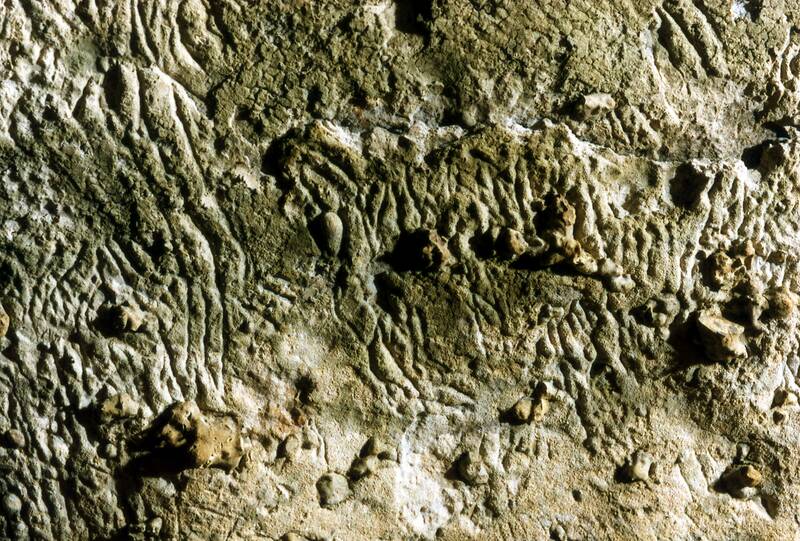 It is striated with bear claw marks prior to the engravings, which evoke the coat but are beyond the contour line at several points: the contour line clearly interrupts many of the scratch lines, especially on the back and abdomen. 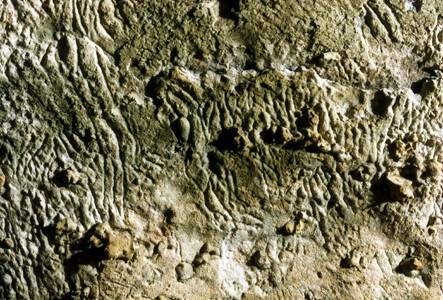 For the most part, these bear claw marks are on the lower right side. The specific determination of this animal has, curiously, been problematic. A. It was A. Glory who first called it a "leaping cat" or a "cat-horse" (félin-cheval), with the hind leg well engraved, "ending with a group of claws. " He noted a square head and glimpsed even a right hind and front leg. He saw a horse head seated in the angle formed by the tail and thigh and, perhaps, another in front below the head (Glory, 1955a). Many others have seen a composite cat-horse. Delluc, B. et G. (1997) believe that this animal has all the characters of a horse. The only things which are a bit disconcerting are the expansion of the back of the chest, the presumed location of the root of the forelimb and the existence of a vertical line at the head giving the false impression of a snout more or less square in extension, but in every way too short. This bovine is in right profile, engraved rump to rump with horse 14. It forms a rectangle of 210 cm wide and 126 cm high. The end of the rump is located236 cm above the present soil level, i.e. about 150 cm above the original ground level. It is drawn using a stroke with angular cross section, except at the level of the hair of the mane, the head and the neck. This large figure is incomplete, without legs and tail. 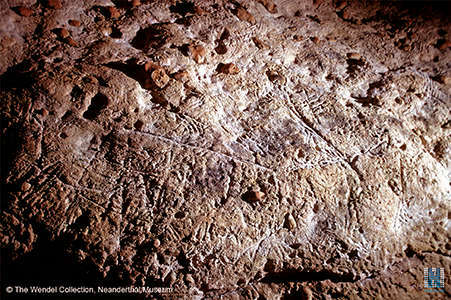 The withers (the ridge between the shoulder blades) is not marked; neckline, long, is curiously adorned with a mane erected like that of a horse, but in this case without a line to indicate the top of the neck as is shown in the engravings of horses at this site. The back, made up of several strokes, is horizontal. Lines of hair are shown meeting the lower edge, also horizontal, of the head but do not cross it. The front of the head is convex but the muzzle is very narrow, without details. The long winding horns, with a double curvature "S" shape are shown, one by two converging lines, the other by a single stroke. They are displayed one above the other, pointing forward. They start on the front line of the head, without any attempt at perspective. The eye is formed from the hole left by the fall or removal of a flint nodule. A hole left by a fallen flint, at the bridge of the nose, has fallen before the drawing of the figure, since it carries an engraved line. The dewlap is hardly shown, the abdomen appears thicker, without the anterior porte-à-faux characteristic of bisons. A sort of sign or mark of the coat made of hatched lines appears, in a band on the flank, but they may be modern fortuitous accidents. The attachments of both front legs show perspective (the right leg is behind the left). Some bear claw marks are visible near the head and back. The surface is marked with modern graffiti and some traces of smoke. For A. Glory, this figure of the "beautiful bovine" was the most spectacular of the cave. He noted the resemblance of the horns with those of certain figures from la grotte d'Ebbou, the eye represented by the cavity left by the fall of a flint nodule, while he said, "the ear is marked with a large flint nodule", which to us seems unconvincing. The engraving consists of a right profile, with just the dorsal line leading to the head on the right of the image. Above the bison is what appears to be a phallus. 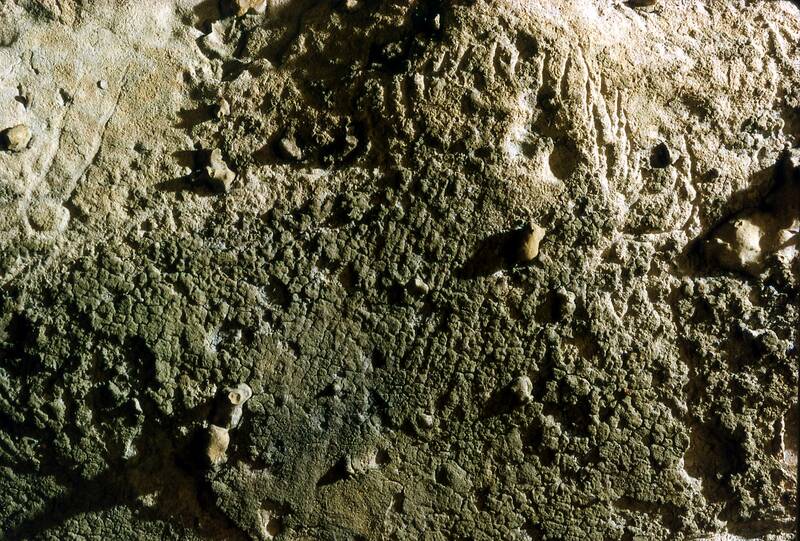 The crack along the lower part of the image and the cave bear claw marks are not a part of the engraving of the bison. The bison is in right profile. It forms a rectangle 178 cm wide and 64 cm high From about the level of the horns is a distance of 293 cm above the current soil, while the visible end of the back is 303 cm above ground level, approximately 150 cm above the original ground level. The massive head overlies the neck of the contiguous Horse 16 underneath. The neck of the bison is in the same line as the dorsal line of the horse, but they are head to head. The track is most often done by large, angular cross section strokes, cutting away the surface layer of green marl to reveal the plain limestone, with flaking on both sides of the line. 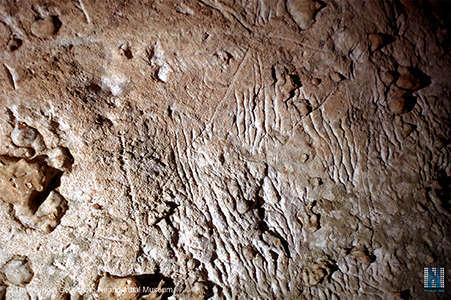 The line of the back, cut deep, is carved with a tool with several points. 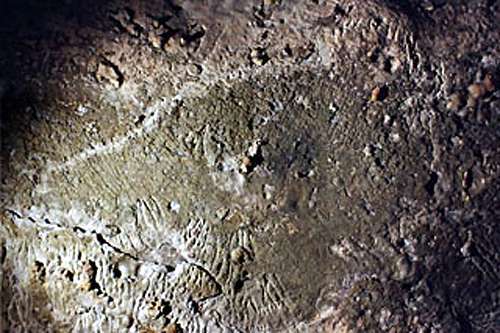 The mane is achieved using an irregular cross-section tool and the lines are more curved, as is usual for the manes of most other animals in the cave. 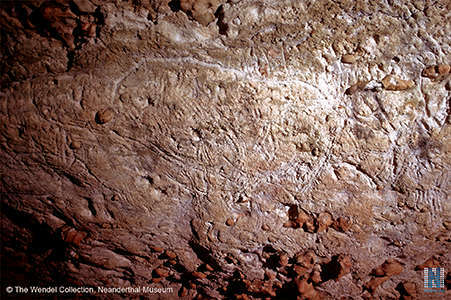 The presence of a small flint flake stuck in the line of the back near the phallus was noted, although it was not possible to establish a relationship between the flint and the act of the artist. 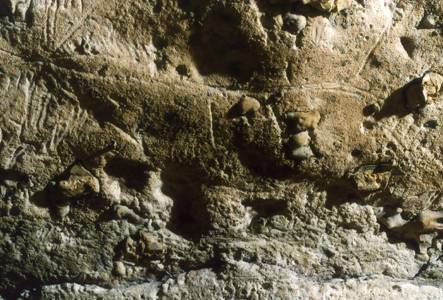 There were two other similar fragments embedded in the wall, outside the engraved lines, at a distance of twenty centimetres in front of the horns and ten centimetres below the central part of the line of the back. 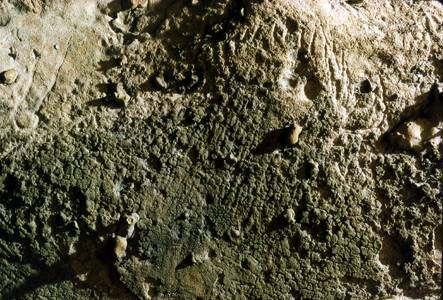 It is remarkable that the surface above the cervico-dorsal line consists of clean white rock, while the surface within the engraving is covered with the original green marl, such that the bison appears, under front lighting, like a colorful mass. 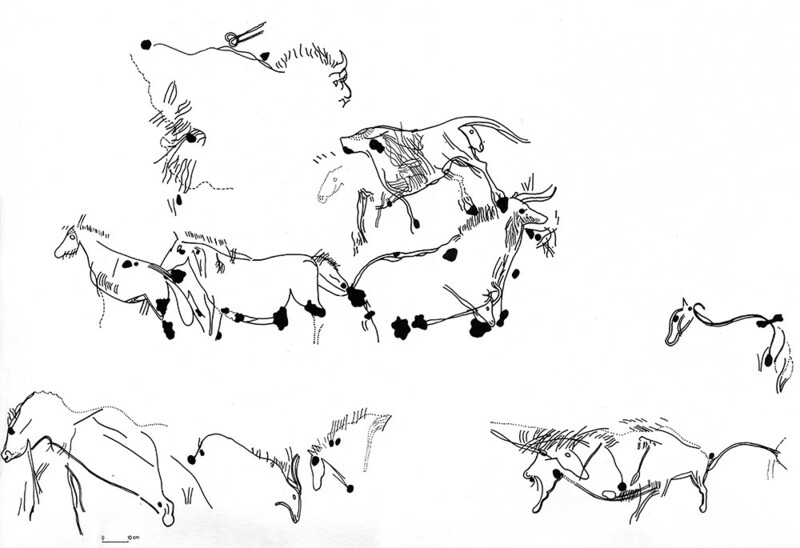 It is a cameo effect, similar to that observed in the Bison in the well of Lascaux. 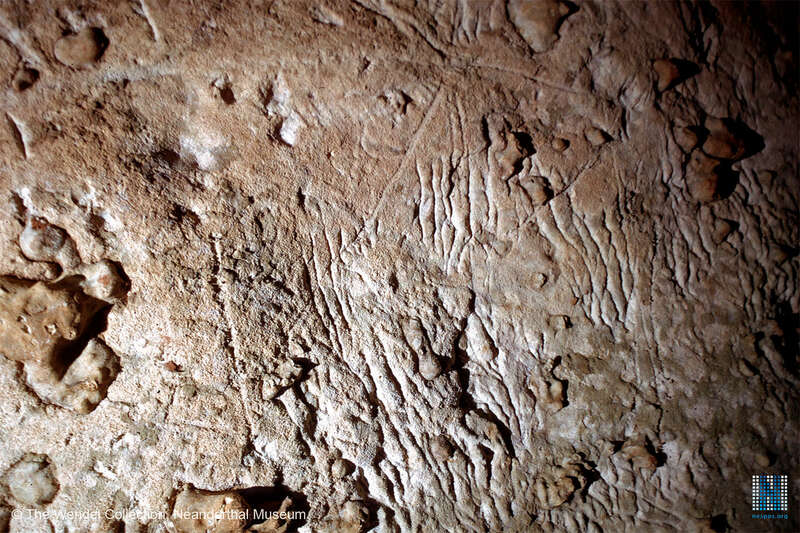 There are many bear claw marks on the bottom left of the figure. 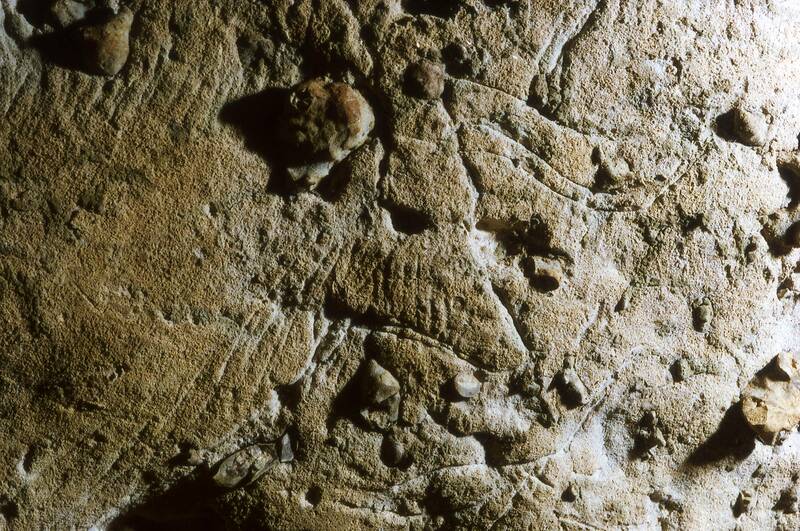 On the small of the back, and intersecting the contour line, successive parallel traces appear, slightly oblique to the lower right, very worn, that may be remnants of very old scratches. In this engraving, the bison has only the back and the hump represented, as well as the head with two particularly sinuous horns, and perhaps the eye. The two horns are drawn one above the other, which is not very realistic, they should overlap. Behind the horns, the mane of the withers starts, very convex, shown by vertical hairs, describing the back of the neck, while the back is slightly convex, and beyond, a lumbar lordosis is evident. Another version of the bear. This figure is deeply engraved. The section which shows the head, the front line of the chest and the front of the animal forms a rectangle 48 cm wide and 84 cm high. 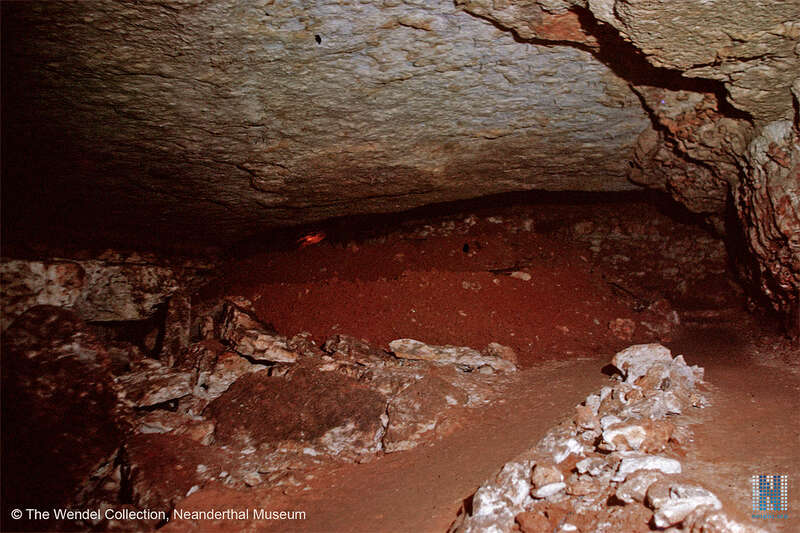 There is a line scribed coming from the mouth representing the breath of the animal, and the end of this line is 219 cm above the current ground level, and 120 cm above the original floor of the cave. The animal is drawn in left profile, and is clearly a bear. A flint pebble forms the eye, although it is too large. The normal protrusion of the forehead of bears is not shown. The muzzle is indicated, with a mouth and nostrils visible, from which escapes a short stroke, which can be interpreted as breath. The angle of the jaw is marked. The wall has, at the head and shoulder level, two strong convexities accentuating the impression of power of this representation. The back is evoked by a horizontal crack with a convexity to the supposed location of the withers and the small of the back. Thus, the whole of the beast would measure about 150 cm wide. 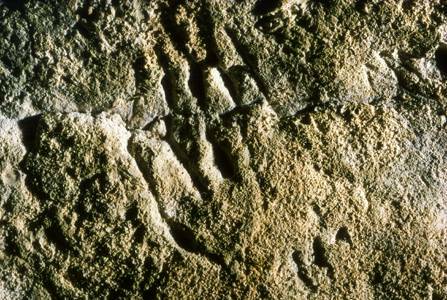 One notes also the marks of the claws of a bear at the front of the drawing, another in front of the front leg and one below it: some impacts of modern tools and the trace of many fingers at the level of the shoulder. A. Glory observed that "the line of the lower jaw has been placed on an ovoid projection of the ceiling"(Glory 1955a). The wall at the cheek is naturally convex. The chest is made of a sturdy straight line. Legs are not clear, but we have a feeling that in their distal part, both are evoked by vague effect of perspective, and one of them (the right) ends with a bulge embodying the foot. The general silhouette, particularly at the front, is more characteristic of the brown bear than the cave bear. - Vialou (1976). "It takes advantage of previous bear claw marks. It forms a rectangle 135 mm wide and 210 mm high (Fig. 7 and 26). It is arranged vertically and intersects a horizontal crack between the white rock wall, at the bottom, on an area already more like marl, greenish brown, at the top, especially at the ends of the fingers. The identified point (R3) is located at 1.97 m above the present ground level, which is uneven at this point (1.40 m above the ancient soil)." Bear Claw marks on the wall. Breuil H., 1952: Quatre cents siècles d'art pariétal, Montignac, Centre d'études et de docu mentation préhistoriques, 419 p., 530 fig., 1 pl h. t.
Delluc, B. et G., et Guichard F., 1997: La grotte ornée de Bara Bahau (Le Bugue), Bulletin de la Société historique et archéologique du Périgord, 124, p. 31-62, 16 fig. Delluc, B. et G., 1997: Les gravures de la grotte ornée de Bara-Bahau (Le Bugue, Dordogne), Gallia préhistoire. Tome 39, 1997. pp. 109-150. Glory, A., 1955a: Bara-Bahau, Le Bugue-sur-Vézère(Dordogne), Monteuil, Imprimerie spéciale de Banque, 20 p., ill., préface de H. Breuil. 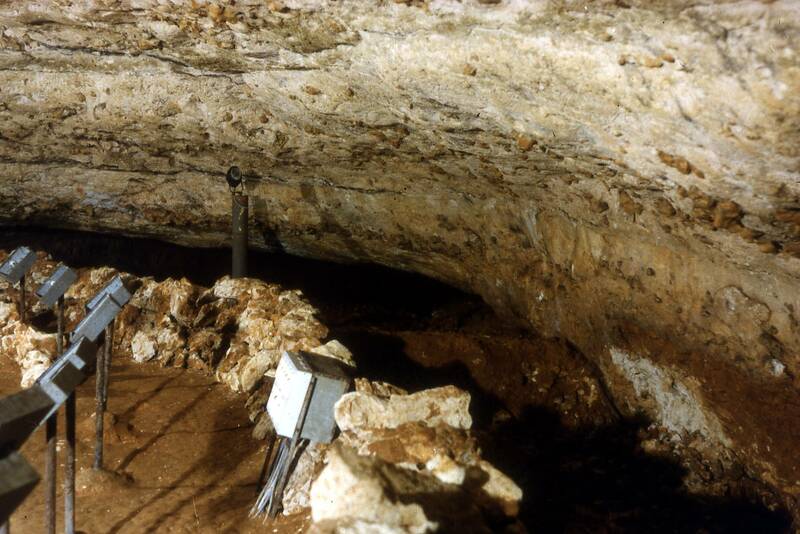 Glory, A., 1955b: La caverne ornée de Bara-Bahau, l'an 40000 naissait l'Art, Le Bugue, 20 p.
Vialou D., 1976: Guide des grottes ornées paléolithiques ouvertes au public, Paris, Masson, 128 p., ill.